While the Research Wizard has over 650 different fundamental data items to pick and choose from and up to 12 years of historical data, it also gives the user extraordinary flexibility to create his own customized items and ideas. With the Research Wizard’s Calculation Expression feature, you can compare an item to another item, combine different items together, you can even compare an item’s value to its value from a different time period and so much more. 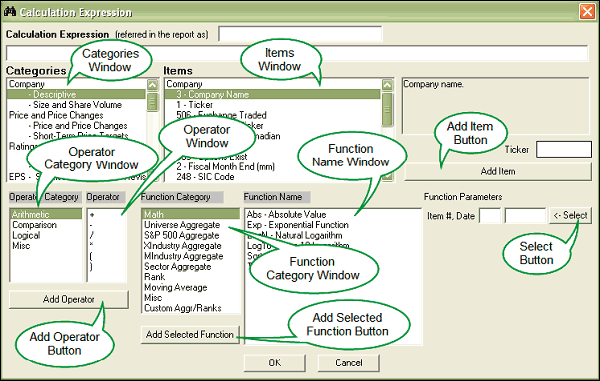 Calculation Expressions are built by selecting items, time periods, operators and functions from the corresponding menus of the Calculation Expression window. The Research Wizard provides a comprehensive set of operators and functions that you can use to create new items and complex calculations. The Calculation Window is quite intuitive, and once you use it a few times it will become very easy to understand. In this example, let’s compare a company’s Cash Flow to its 5 Year Average Cash Flow. In the Categories window, under Ratios, select the ‘Valuation’ Sub-category. Note: At the end of this Item’s Description, you’ll see in parentheses it reads ‘(3 Yr)’. That means there’s 3 Years of data (or 3 Yearly data points) for this item in this particular database that you can access. Other data frequencies you’ll find are ‘Wk’ for Weeks, or ‘Qtr’ for Quarter or ‘Mth’ for Monthly and etc. Note: You’ll notice that each item has a numerical identifier in front of it. In this case, the item ‘Cash Flow’ has a numerical identifier of 106. The reason for theseidentifiers is because the database doesn’t read the words Cash Flow forexample, but rather the number used to identify the Cash Flow item. Once theitem is added to the long dialogue box to build an expression, an ‘i’ followed by the identifying number will be shown. (The ‘i’ stands for item.) So i106, as shown in our calculation, means ‘Cash Flow’. 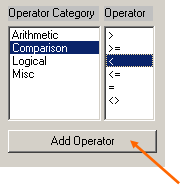 Next, go down to the Operator Category window and select Comparison. 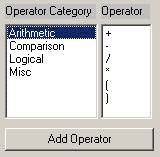 Then in the Operator window, select the ‘greater than’ operator or ‘>’. Run this screen as it is or build upon it by adding more items. When we run the screen, the report will show all of the qualified stocks that meets this criteria. But the report will simply show ‘ 1 ’s for the value, meaning the condition is true, i.e., the current Cash Flow is greater than the 5 Year Average Cash Flow. A Menu will drop down. When it does, left-click on Delete and the column will disappear. Next, in the Categories window, under Ratios, select the Valuation Sub-category. 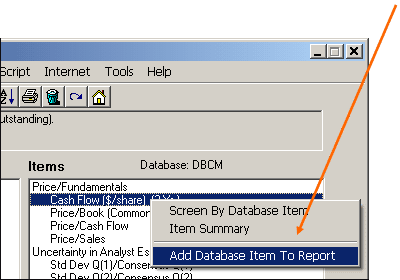 Then, in the Items window, left-click the Cash Flow item one time (to highlight it) and the right-click it. A Menu will then appear. When it does, left click on Add Database Item to Report. The Report Column window pops up. Keep the selection as Recent and click OK. The Cash Flow will item will now be added to your Report. Now go back to the Categories window and under the Growth Category, select the Dividend and Book Sub-category. Then in the Items window, left-click one time (to highlight) the 5 Year Average Cash Flow item. Then right-click it. When the Menu pops up, left-click on the Add Database Item to Report. Then when the Report Column window pops up, keep the selection as Recent and click OK. The 5 Year Average Cash Flow will now also be added to your report. Now when you run your screen, the report will show the current Cash Flow and the 5 Year Average Cash Flow. ... and the Logical Operators (also shown below). These are the most common Operators when combining Items together.. In this example, let’s say you wanted to look for stocks that have a current Zacks Rank that is better (lower) than the Zacks Rank from one week ago. In the Categories window, under Ratings, select the ‘Current’ Sub-category. And then in the Items window, select the Zacks Rank. To complete the first part of your calculation, click on the Add Item button and the (recent) Zacks Rank (i.e., i192) will be added to the long dialogue box. If you did it correctly, it should look like the illustration below. 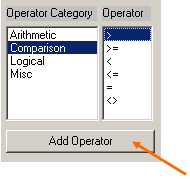 Next, go down to the Operator Category window and select Comparison. 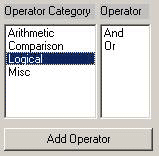 Then in the Operator window, select the ‘less than’ operator or ‘ < ‘ . Locate the Period box or ‘Recent’ drop-down box to the right of the Items window and select the ‘Recent-nW’ iteration. database. W = Weekly, Q = Quarterly, Y = Yearly, etc.) Recent-1W means it’s looking at one period before the most recent or current period (i.e., 1 Week before the Recent period). Which means, the current Zacks Rank is less than (i.e., better than) the Zacks Rank from 1 week ago. Next, in the Categories window, under Ratings, select the Current. 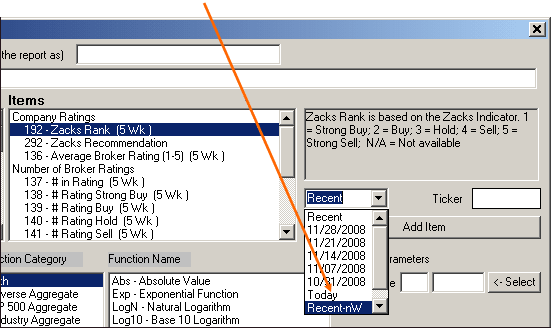 In the Items window, left-click on the Zacks Rank one time to select it (highlight it), then right-click it. The Report Column window then pops up. The Zacks Rank will now be added to your Report. Go back to the Items window where the Zacks Rank is highlighted and right-click it again. When the Menu pops up, left-click on Add Database Item to Report. Then when the Report Column window pops up, drop down the Recent drop-down box and select the Recent-nW iteration. 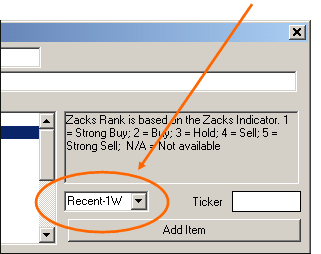 The Zacks Rank from 1 week ago will also now be displayed in your report. The Calculation Expression feature is one of the most powerful and versatile parts of the Research Wizard program. Once you’ve created a few calculated expressions on your own, you’ll find yourself using it again and again to create customized screens and reports and to produce virtually any kind of data you can imagine.